Industrial Schools Act 1874 (WA), courtesy of State Law Publisher of Western Australia. The Industrial Schools Act 1874 (1874/011) was the first comprehensive attempt at child welfare legislation in Western Australia. The Act served double duty as a means to care for children identified as needy, and to be able to punish young offenders by sending them to gaol. These separate functions led to further amendments and resulted in the Industrial and Reformatory Schools Act 1893. Both Acts were repealed by the State Children's Act 1907.
to promote the efficiency of schools, orphanages, and other kindred charitable institutions that have been founded for the purpose of providing for and educating orphan and necessitous children, by giving greater powers over such children to the directors and managers of those institutions. At present these authorities were powerless to retain in custody any child voluntarily surrendered to their charge, and the object of the Bill before the House was to grant them such powers as would enable them to do so, and to stand in Ioco parentis towards the children placed under their management. At the conclusion of the debate (p.14), the Bill was referred to a Select Committee for further consideration. This was known as the Select Committee of the Legislative Council appointed to consider and report upon the Bill to promote the efficiency of certain Charitable Institutions. The Select Committee's report was tabled on 27 July and a number of amendments were debated on 30 July in response to the report. The Industrial Schools Act 1874 came into operation on 6 August 1874. As stated in the preamble, its purpose was to provide for and educate 'orphan and necessitous children, or children or descendants of the Aboriginal race' but it also prescribed the way young offenders would be treated. The Act was based on the principle that these children (to age 21) would have a better chance at life if they were subject to the guardianship and discipline of the managers of charitable institutions. The Act defined an 'infant' to mean an 'infant, child or person' (s.19) and 'certified' institutions to receive, provide for and educate them (s.2). By modern standards, the Act is harsh and punitive but at the time it was an attempt to regulate the treatment of children and young people, particularly those who seemed to be neglected or abandoned by family, and 'juvenile offenders' who at that time were sent to adult prisons. It represents the tension between a belief that children should not be a burden on the public or charitable purse if they had parents to look after them, and a belief that many parents were not fit to bring up their children in respectable circumstances. The Act formalised and entrenched the power of the managers of charitable institutions, making them guardians of the children in their institution (s.5) for as long as they felt necessary (ss.7, 8). This could make it difficult for parents who had voluntarily sent their child to an institution to claim them back, but in practice most children were returned if parents were insistent. The Act (s.6) allowed managers of industrial schools to apprentice any child 'either to some trade or as agricultural or domestic servants or to the sea service' as they saw fit providing the child was over 12 years old. 'Youthful offenders' were to be sent to an institution regulated under this Act (s.9) which ideally would be 'as far as possible' of the same 'religious persuasion to which such offender appears to belong' (s.10). The Act provided a mechanism whereby young people could be transferred from adult gaols into an industrial school (s.12), between institutions, or into the hands of a 'trustworthy and respectable person' (s.13) under a license issued by the Colonial Secretary. This time out of the original institution under license would be counted as part of the sentence (s.14). If a young person 'escaped' from an institution, or from the person with whom they were placed under license, they were 'deemed to be guilty of an escape from lawful custody on a criminal charge' (s.15) and anyone who helped or harboured them was likewise guilty (s.16). The Act (s.18) made it 'a duty' for any Justice of the Peace in any district 'make inquiry' about any 'native' or 'crossbreed' child who was 'apparently under the age of twelve years' and who was 'not living under the care or guardianship of either father or mother'. If the inquiry led the Magistrate to have any concerns, the Act made it lawful for him to 'assume the guardianship' of that child. The Act (s.20) also required managers of scheduled institutions to present a report of activities to the Colonial Secretary so that the report could be tabled at the Legislative Council, as a record of how public monies had been spent. The Industrial Schools Act 1874 was repealed by the State Children Act 1907. The Industrial Schools Act 1874 had been subject to the scrutiny of the Select Committee of the Legislative Council appointed to consider and report upon the Bill to promote the efficiency of certain Charitable Institutions before it was enacted. Sources used to compile this entry: 'Charitable Institutions Bill Second Reading [Hansard p13-14]', in Hansard Archive 1870 to 1995, Parliament of Western Australia, 7 July 1874, http://www.parliament.wa.gov.au/Hansard/hansard1870to1995.nsf/vwMainBackground/18740707_Council.pdf/$File/18740707_Council.pdf. The Charitable Institutions Bill became known as the Industrial Schools Act 1874.; To Remove and Protect: Aboriginal Lives Under Control [website], 2010, http://aiatsis.gov.au/collections/collections-online/digitised-collections/remove-and-protect; ; Hetherington, Penelope, Paupers, Poor Relief and Poor Housing in Western Australia 1829 to 1910, UWA Publishiing, Crawley, Western Australia, 2009. pp.98-100. 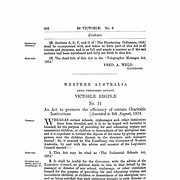 ; Industrial Schools Act 1874 (WA) [Document]; Tilbrook, Lois, Nyungar Tradition : glimpses of Aborigines of south-western Australia 1829-1914, Online version published by the Australian Institute of Aboriginal and Torres Strait Islander Studies in 2007, University of Western Australia Press, 1983, http://aiatsis.gov.au/sites/default/files/catalogue_resources/m0022954.pdf; Law Research Service, Melbourne Law School, Law Library, The University of Melbourne. 'Find and Connect Project - Western Australia Legislation', 13 December 2013, held in the project files at the University of Melbourne eScholarship Research Centre. Report of the Select Committee of the Legislative Council appointed to consider and report upon the Bill to promote the efficiency of certain charitable institutions, 27 July 1874. Western Australia Votes and Proceedings 1884, Paper A6.